Coming off their first loss in conference play this season, the Rams will look to get back on track when they take on Massachusetts on Thursday. VCU lost 69-72 to George Washington last Saturday, a game that snapped its 12 game winning streak including 9 straight in conference play. Despite the recent loss, VCU (17-6, 9-1 A-10) is coming into this matchup playing very good basketball. Massachusetts (9-13, 2-8 A-10) is not. The Minutemen have lost 8 of their last 9 and haven’t been able to get much going since conference play began. While VCU will undoubtedly be heavily favored, the Minutemen could have what it takes to hand the Rams their second straight loss on Thursday night. Kenpom predicts VCU to take down UMass 79-69 and gives the Rams an 81% chance of winning on Thursday night. VCU really should have a good advantage on the boards against the Minutemen. The Rams have the 50th best offensive rebounding rate in the country; Massachusetts ranks 254th in that category. If Mo Alie-Cox and Justin Tillman crash the boards like they normally do, we could see VCU getting a ton of extra possessions, and as a result, it could be a long night for Massachusetts. Another statistic that really swings in the Rams’ favor is 3 point shooting. 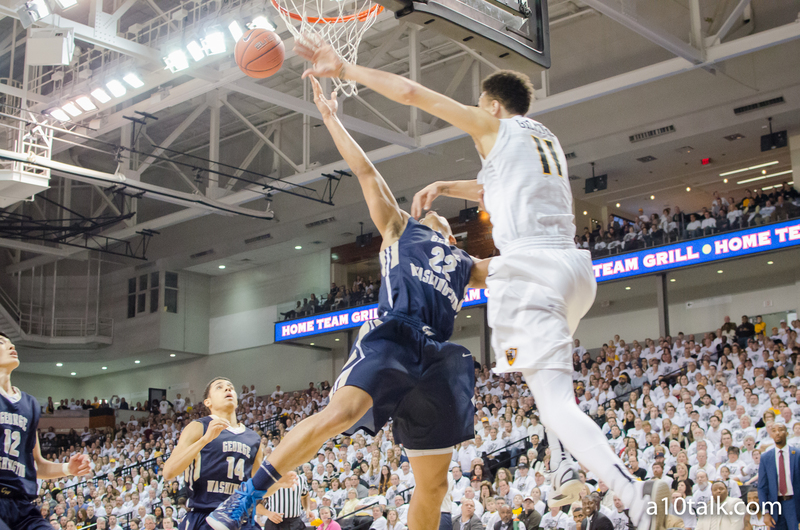 VCU is knocking down 39.3% of its attempts from long range in conference play, good enough for 1st in the Atlantic 10. UMass, on the other hand, ranks dead last in the conference at 28.1%. If the Rams start to fill it up early, there will be no way for the Minutemen to catch up. Unfortunately for Massachusetts, there aren’t a lot of factors that are working in its favor. The Minutemen are decent at protecting the basketball, ranking in the top 100 nationally, but VCU’s defense turns the opposition over more than almost any other team in the nation. Massachusetts’ Trey Davis and Donte Clark have the ability to put up a lot of points, but VCU has the 20th most efficient defense in the nation; my guess is that it will be very hard for the Minutemen to score on Thursday night. While VCU is certainly favored to win in this one, there’s no counting out the Minutemen just yet. Though they haven’t found much success in conference play, they are playing at home and could pull off the surprise if they really get going. Massachusetts’ guards are going to need to erupt right out of the gates. The Rams are going to try to shut them down, but they’re going to have to play quick and explosive to stand a chance. Don’t expect this one to be very close, but stranger things have happened in the A-10 this season.